Massively overstable meathook of a driver! Great for shaping your shots. Look no further than the Hellfire. Tested by power throwers, this disc maintains a consistent hyzer line and will not turn over making it a reliable choice in windy conditions. 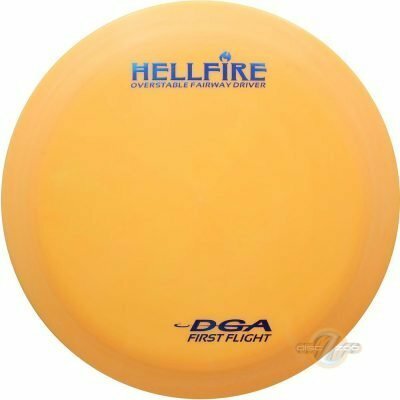 Backhand throwers will love the Hellfire’s predictable hyzer lines. Sidearm throwers can trust its stability and will be able to throw accurate flex shots. The Hellfire is a great utility disc, perfect for rollers and overhand shots as well. It features a true flat top and feels great in your hand. ProLine plastic blends are tough, tacky and have incredible performance. The ProLine plastic blend features increased marbling, pearling, and aesthetic appeal. DGA ProLine plastic is recommended for players that are looking for increased grip and durability, balanced with high performance flight qualities. ProLine style plastic will take less time to beat in and will reach its intended flight characteristics faster than the DGA SP Line blend. ProLine plastic is one of two DGA premium plastic blends and is an excellent compliment to the SP Line.